Managua is located on the southern shores of Lake Xolotlán, also known as Lake Managua, in the western part of Nicaragua. Situated roughly halfway between the old colonial cities Granada and Leon, Managua became the capital of Nicaragua in the 1800s to calm the power struggle between conservative Granada and liberal Leon. Managua was seriously damaged by earthquakes in 1931 and 1972, respectively. The 1972 earthquake destroyed 90% of the city’s downtown area and this is why Managua no longer have the traditional city outline with a central plaza and commercial and public activities concentrated to a common downtown area. Instead, visitors need to learn how to navigate between various small hubs where markets, malls, night clubs, restaurants, hotels and cultural establishments have sprung up. This animal park is home to many different Nicaraguan species, including birds, mammals and reptiles. Some non-native species also live here, e.g. peacocks and emus. Examples of animals that live in Zoológico Nacional are the Guardabarranco (Eumomota superciliosa), Baird’s tapir (Tapirus bairdii), the Northern tamandua (Tamandua mexicana), the Coatimundi (Nasua narica), and many Central American parrot species. There is a special area where you can walk among a proliferation if colourful butterflies; this area is filled with beautiful tropical flowers that the butterflies feed from. Zoológico Nacional de Nicaragua is located near the 16 km mark on the highway between Managua and Masaya. Plaza de la Revolución is located in what used to be downtown Managua, near Lake Xolotlan. The area was largely destroyed in the earthquake of 1972, but some buildings are still standing – including Catedral de Santiago and the building that houses the Rubén Darío National Theater. Plaza de la Revolución features a lot of monuments dedicated to national heroes, such as Carlos Fonseca, Rubén Darío and Josefa Toledo de Aguerri. 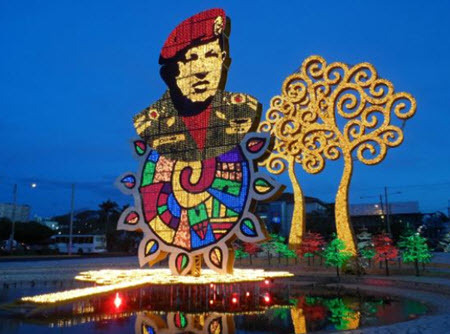 This is also where you will find the peace monument (Monumento à la Paz) and the monument honouring the unknown guerilla soldier (El Guerrillero sin Nombre). The ancient footprints of Acahualinca are human footprints made some 6,000 years ago, by a group of men, women and children that walked through a muddy area near the southern shore of Lake Managua. The footprints were preserved thanks to a combination of mud and volcanic ash, and found by workers in 1874. They are the oldest known footprints in the Americas. Fossilized footprints of several animals are also present at the site. Today, the area is known as Acahualinca and is found just west of Managua. In 1953, Museo Sitio Huellas de Acahualinca was founded in Acahualinca to protect and display the footprints. This museum also displays pre-columbian pottery and other artefacts from various parts of Nicaragua, including ceremonial funeral vessels. Mercado Huembes is bustling market where you can by anything from food to clothes, electronics and souvenirs. It’s a good place to buy hammocks, handicrafts, fruits and vegetables at competitive prices. Another option is Mercado Oriental, which is Nicaragua’s largest market. It is however considered a bit more shady than Huembes and is less popular among the tourists. If Managua gets to hot and heavy, leave the capital behind and take a microbus to Masaya or Granda. In Masaya, you can by locally made handicrafts and visit Masaya Volcano National Park. The volcano – also named Masaya – is highly active and you can hike all the way to the brim and peek down into the crater. Please note that sometimes visiting the volcano is unsafe because it’s being too active. There is a visitors centre in the park where you can obtain up to date information from the staff. At night time, guided walks to a bat-filled cave are available. Founded in 1524, Granada is the oldest colonial town in Nicaragua and is brimming with history. The town has a traditional outline with a main square serving as its heart, flanked by the Cathedral, the Mayor’s office and several hotels in carefully renovated colonial buildings. Granada is a pedestrian-friendly town that should ideally be explored by foot. Why not stroll down from the main square through the bar and restaurant-filled La Calzada street and all the way to the shores of Lake Nicaragua? While in Granada, you’re just a short journey away from Laguna de Apoyo, an old dormant volcano where the crater has filled up with water, forming a great lake for swimming in this unique environment. Augusto C. Sandino International Airport (IATA: MGA)(ICAO: MNMG) is Nicaragua’s main airport and is an important hub for both domestic and international flights. It’s located near the northern highway, approximately 11 km from downtown Managua. Right across the street from the airport is a Best Western hotel, a convenient (although a bit pricey) choice if you are landing in Managua late in the day or need to catch a flight out of Managua early in the morning. Over ten different airlines offer international flights from Augusto C. Sandino International Airport. Examples of destination with frequent flights are Miami (USA), Fort Lauderdale (USA), San José (Costa Rica), Panama City (Panama) and San Salvador (El Salvador). The airline La Costeña offers domestic flights to local destinations such as Bluefields and Big Corn Island. The airline Nature Air offers flights to neighbouring countries, especially Costa Rica. Two well-known international long-distance bus companies that traffics Managua are TransNica and TicaBus. TransNica goes from Honduras, through Nicaragua and into Costa Rica (and vice versa). You can chose between standard trip and executive trip. The address to the TransNica terminal in Managua is “de la rotonda de Metrocentro, 300mts al lago, a un costado de la D.G.I”. With TicaBus, you can get to Managua from Mexico, Guatemala, Honduras and El Salvador in the north, or from Panama and Costa Rica in the south. At their Managua terminal, TicaBus has a hotell with 32 economy rooms and 17 executive rooms. The executive rooms have air conditioning, private bath and cable TV. At the time of writing, the nightly price for a single executive room is 29 USD. It’s definitely not luxury rooms, but they are clean and safe. Address: “2 cuadras arriba antiguo cine Dorado, Barrio Bolonia”. There used to be trains in Nicaragua, but the railway system fell into despair after the revolution. In the 1990s, the Chamorro government sold the railway metal and the trains. Since then, there has been no railway system in Nicaragua.